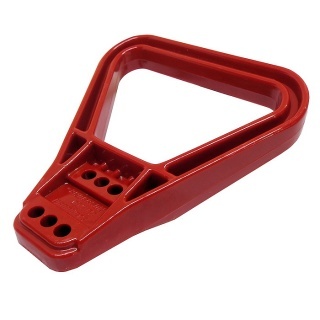 Red polycarbonate handle for 175A and 350A battery connectors. 0-431-75, 0-431-35, 0-432-75 and 0-432-35 connectors. Anderson type medium sized connectors; SB175, SBE160 and SBX175. Anderson type large sized connectors; SB350, SBE320 and SBX350. 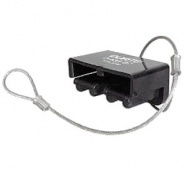 'In use' images show connection to an SB type 350A connector (not supplied). 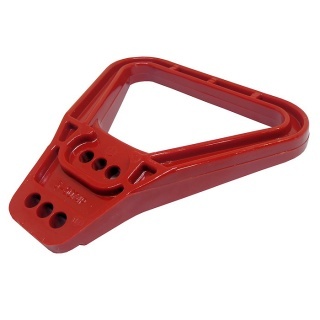 The 160, 175 and 320 amp 'A' frame red handle comes supplied with fixing bolts to connect to the red or grey connectors. Usual practice is that the fixed connector (equipment side) has no need for a handle as it attaches to the bulkhead or equipment, the connector attached to the battery side is best suited to require the handle. 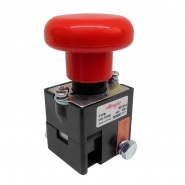 The easy connect and disconnect afforded by the handles action, as well as keeping operator hands away from the plug, also ensures that the operators are less likely to pull on the battery cables. 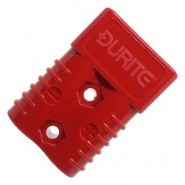 Durite protective cover and lanyard for part numbers: 0-431-75 and 0432-75.